I loved campfires and marsh-mallows—so many marshmallows! I loved endless supplies of fruit punch and gutter sundaes and treasure hunts. I loved rainy days in the art room and quiet times in the woods. I liked early morning swims and wearing the same pair of shorts every single day until my parents picked me up when camp ended. When I was in college, I loved summer camp, too. I loved working as a camp counselor, roasting marshmallows for campers, mapping out treasure hunts, and reading quietly to kids under the glow of a flashlight. I loved rainy-day snacks and wearing the same pair of shorts every day until it was time to go back to class in the fall. When I was a kid, I never really thought much about which camp I attended and why. I went to basketball camp because I wanted to be a better player in high school. I went to art camp because I liked paint and clay. I went to computer camp because, well, I think my parents needed to put me somewhere while they worked. But before you go digging through brochures and cruising the Internet for that perfect summer experience, consider a few key factors that make any camp—whether it’s sports-based, dance-based, or faith-based—a successful experience for you and your camper. 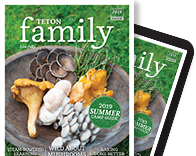 “I think it’s important to consider a lot of different factors,” says Melissa Young, camp program head at Teton Valley Community School. “You need to look at your family’s needs, you need to look at the age of your children, and you need to look at the opportunities that they [don’t] get during the school year.” Parents should consider the camp’s schedule, staff, and the program. But most importantly, parents need to consider just how excited their child is to attend camp day in and day out. So ask: What training does the staff receive? Does the camp require First Aid training? Does the camp conduct background checks on staff? Where do they recruit their staff from? And what is the staff return rate? It’s always appropriate to meet the men and women who will be working and playing with your camper. Young reminds us that it’s just as important for a parent to feel comfortable with the staff as it is for the child to feel at ease. Emily Boespflug, camp director for the Center for the Arts summer camp program, agrees. “Take some time to talk to your kids before camp,” she says. “Think less daycare and more learning … The kids that know why they signed up are more into it.” Parents that drop kids off for the day without direction or discussion have a harder time getting into the program. She explains that her program’s mark of a successful week are happy kids who are having fun and learning something new. Young reminds us that financial aid programs and grants for summer camps can and should be sought by parents. Simply asking can help camp directors begin the process of working toward a financial aid program. 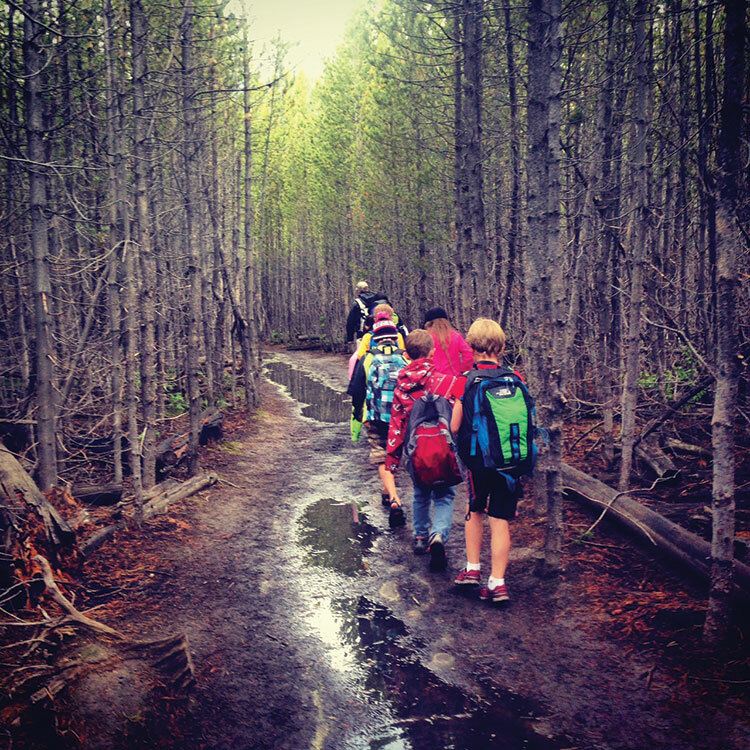 There are many different reasons that parents choose summer camps. Some belong to clubs and resorts that offer summer camp amenities, others need a daycare option for June, July, and August, while others look to expand and build upon classroom academics. Regardless, summer camp offers a unique experience beyond the books, one that can have lasting and lifelong impacts. Camp plants a seed that gets cultivated through the experience, year after year, into valued character traits. Teton Valley, Idaho, mom Jen Fisher homeschools her two girls. She explains that summer camp is an important part of their education, teaching social skills as well as expanding their world outside of the home. For Jackson mom Katharine Confer, summer camp came as a natural extension of her own dynamic experience growing up as a camper. She didn’t question whether her daughter would love a summer camp program. Confer says she is quick to jump on a camp’s schedule, sometimes calling the camp before the summer programs are released. This helps ensure that her family’s summer schedule can accommodate the camp’s. Most profound are the relationships that carry over the long winter months and into adulthood. Victor, Idaho, resident Amy Hatch looks forward to the day her daughter, Grace, attends summer camp, just like she did for nine years of her childhood. Hatch recounts her lifelong summer camp friends, one who served as her maid of honor when she was married three years ago. 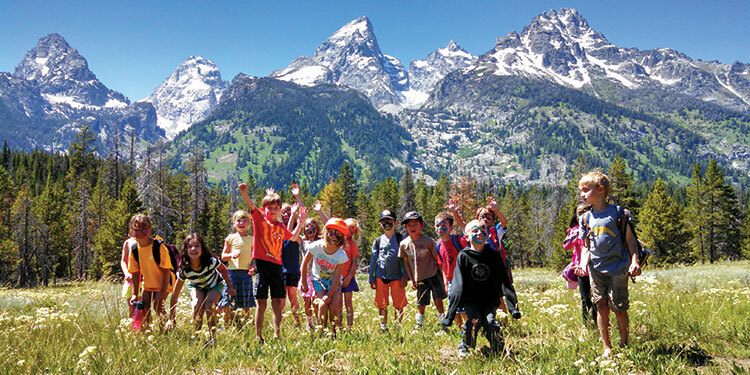 Offering some of the best adventuring in the Tetons, Teton Science Schools and Teton Valley Community School provide a variety of programs for children of all ages and interests. Whether it’s digging deep in the dirt or wandering high in the hills, their camps promise discovery of the natural world. Their Summer Apprenticeship Program offers leadership development for older campers, too. Don’t forget to ask about scholarships! Canvas, clay, and creative fun paint the picture of Jackson Hole Center for the Arts summer camps. Hosted by the Art Association, this camp’s palette of programs inspires creativity and promotes fun. Their summer offerings include options for kindergarten through fifth grade, and middle school and high school students. Art camps sharpen your child’s dance skills, help them discover their inner actor or superhero, or teach them the finer points of plein air painting. Need-based scholarships and aftercare available. 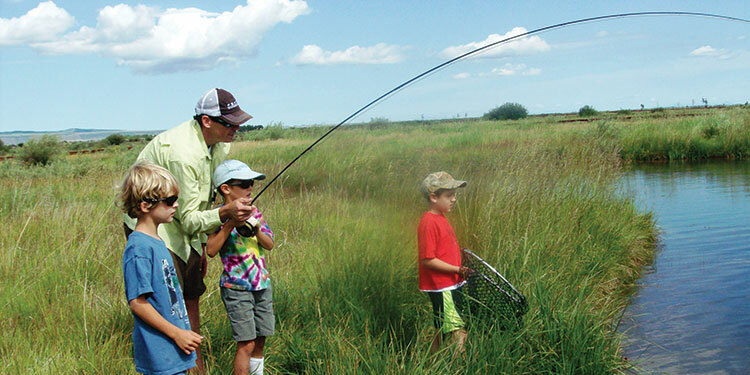 The Learning Academy delivers classic summer camp fun centered on weekly themes. Your child will enjoy water-slide play, bike riding, science experiments, hiking and field trips, and even acting on stage! If it rains, the veteran counselors set up shop in the kitchen, teaching essential baking skills. With a creative indoor facility and large outdoor play area, children can dig in the garden, spread out for craft time, or engage in fantasy play on the pirate ship. And their bunnies and turtle soothe any camper separation anxiety. 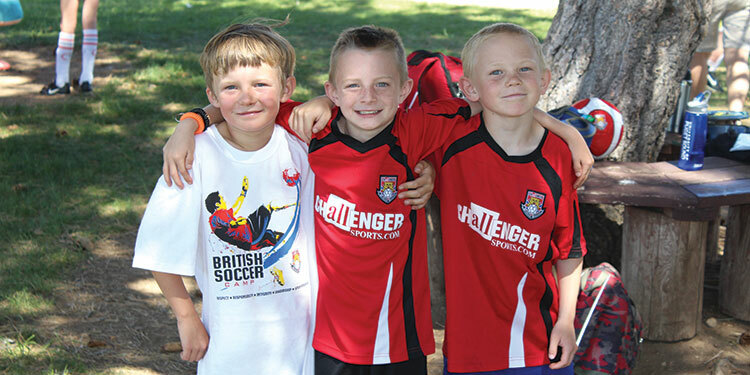 Kick-start your child’s summer with Challenger Sports British Soccer Camps. The British invasion continues in both Teton Valley and Jackson Hole with camps offering professional skill training from collegiate U.K. soccer players. They offer a “First Kicks” program for ages three and four, and full-day and half-day camps for ages ten to eighteen. Each day includes individual foot skills, technical drills, tactical practices, small-sided games, coached scrimmages, and a daily World Cup tournament. Consider hosting a coach for a discount on camp! Dates and times: all summer long, 8:30 a.m.-4:00 p.m. Dates and times: June 15-19, 9:00 a.m.-3:30 p.m. Dates and times: June 22-26, 9:00 a.m.–12:00 p.m. Dates and times: June 15-August 28, 9:00 a.m-4:00 p.m. Dates and times: July 7-21, Tuesday-Friday, 9:00 a.m.-5:00 p.m. Dates and times: summer-long, 8:00 a.m.-4:30 p.m. Dates and times: June 15-August 21, 8:30 a.m.-5:30 p.m. Dates and times: June-August, Monday-Thursday, 9:00 a.m.-6:00 p.m. Dates and times: July 7, 14, 21, 28; August 4, 8:30 a.m.-4:30 p.m. Dates and times: June 15-16, 8:00 a.m.-10:00 a.m. Dates and times: June-August, Monday-Thursday, 10:00 a.m.-4:00 p.m. Dates and times: June 15-19, 9:00 a.m.-3:00 p.m. Dates and times: June 22-August 28, 8:30 a.m.-4:30 p.m. Dates and times: July 13-31, 9:00 a.m.-12:00 p.m. or 1:00 p.m.-4:00 p.m. Dates and times: June 15-August 26, 9:00 a.m-3:30 p.m., 8:00 a.m.-5:30 p.m. Dates and times: June 9-August 18, every Tuesday 9:00 a.m.-10:00 a.m. Dates and times: Saddle Club: June 15-19, 9:00 a.m.-1:00 p.m., Colts Club: June 22-26, 9:00 a.m.-2:30 p.m. Dates and times: June 9-August 18, every Tuesday 11:00 a.m.-12:00 p.m. Dates and times: June, July, and August, 9:00 a.m.-3:00 p.m. Dates and times: summer-long, 7:00 a.m.-6:00 p.m. Dates and times: June 1-August, 8:00 a.m.-5:30 p.m. Dates and times: June 1-29, 10:00 a.m.-12:00 p.m. Dates and times: June 9-August 27, Tuesdays and Thursdays, 8:30 a.m.-4:00 p.m.